Thanks to a loyal reader (and a great sister-in-law) the Queen has been alerted to an important discovery in the form of the New Orleans fried pie. Who knew? Well, New Orleanians, I guess. Apparently Hubig’s is A Really Big Deal down in Louisiana: a regional concern that’s been turning out this specialty since the 1920’s. After Hurricane Katrina, production was suspended for four months; when the distinctive glassine-wrapped friedpackages finally appeared on grocery shelves again, there was much celebrating among the locals. As you can see, the package is adorned with the patron saint of fried pies, the ever-cheery Savory Simon, whose many flavor selections include pineapple, sweet potato, and chocolate. I confess that my previous visits to the Crescent City had not clued me in to the Hubig’s phenomenon. While I hold plenty of fond New Orleans food and drink memories (Café du Monde beignets, Tujaque’s shrimp remoulade, Mother’s oyster loaves, Commander’s Palace Eggs Sardou, and, embarrassingly, Hurricanes in souvenir glasses on Bourbon Street) I had never made the acquaintance of Savory Simon. Our surprise package arrived via overnight mail. After poring over the wrapped treats like aborigines examining the Coke bottle in The Gods Must be Crazy, we unwrapped our Hubig’s and, following the instructions, microwaved the pies for 25 seconds. The result? 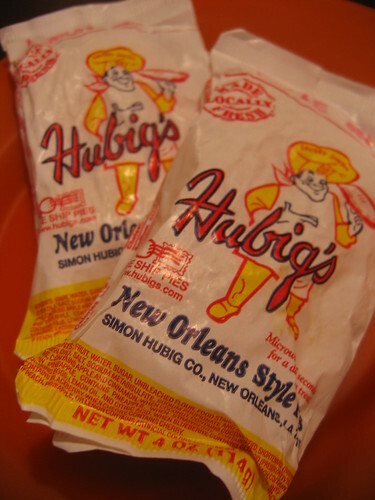 Well, I’m not making a special trip to New Orleans any time soon just to pick up a Hubig’s or two, although I can respect how they became a local thing. There are lots of testimonials to be found on the ‘net and nobody can accuse New Orleanians of not knowing a good thing to eat when they see it. But, you know, maybe it’s an acquired taste. For heaven’s sake, I’ve lived in St. Louis, home of toasted (read: fried ) ravioli, and Cincinnati, where they put chili on spaghetti of all things. So who am I to question another city’s hometown favorite? Plus that Savory Simon looks like my kind of guy. I am glad your souvenir from the Big Easy arrived. Well, how did they taste? They may have been squashed and a little stale from the trip. Any worse/better than a Hostess pie? Chili on spaghetti is actually pretty good. I grew up with a frugal but filling concoction called "chili mac" - simply chili and macaroni. This was featured about once a month on the menu for school lunches. Chili on spagetti is pretty much the same thing with pasta of a different shape, no? 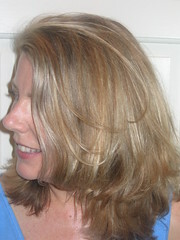 I think freshness might be key. In order to truly evaluate their merit, the Queen should probably embark on a field trip, er, fact-finding mission. New Orleans or bust! Cincinnati's three-way (or four-way or five-way) chili concoctions are pretty unique. Lots and lots of spices, although, alas, curry is not among them.